The world of sports is no longer an exclusive men’s club. There are now growing ranks of women participating in professional sports leagues. We have we seen the historic hiring of the first two female assistant coaches in the NBA, the first full-time female NFL official, and most recently the hiring of the first female NFL assistant coach by the Buffalo Bills. In North America, for example, sports participation among high-schoolers overall has jumped from 25% to more than 35% over the past 35 years, led by a near doubling among girls, from 17% to 32% over that period. Studies by US professional sports leagues show that consumers’ interest in sports is highly influenced by whether they played when younger. Makes sense! 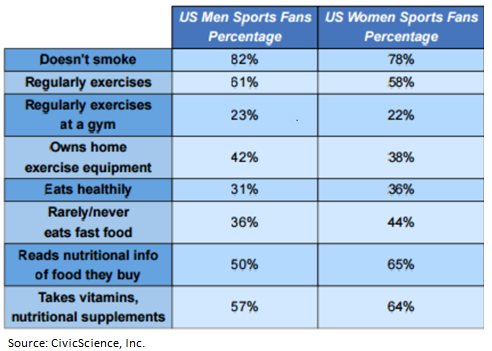 I like to refer to this growing (now 41%*) segment as “Sports Fematics.” A Sports Fematic myself, it was troubling that during the NFL playoffs this year there seemed to be a total alienation of this powerful consumer base to marketers. Just about every commercial was speaking specifically to men. So why do marketers pay premium dollars for a message that only talks to just over half of the captive sports audience? The reality is that women are actively engaged, informed, and vocal about their favorite teams, whether it’s the NFL, NHL, MLB, NBA or NCAA. We are seriously loyal to our favorite teams – wearing licensed merchandise, calling sports talk shows, and posting on social media sites before, during, and after the game. Coming off the heels of another NFL season, and poised for the start of March Madness, I wanted to see what we could learn from the Super Bowl and Sports Fematics in general. There is great opportunity right under the noses of brand and sports franchise marketers to get a better return on their investment. First, let’s find out more about the Sports Fematics. Sports Fematics are college educated, which may explain why NCAA Football and Basketball respectively index right behind the NFL and MLB as our favorite sports. NHL follows closely behind. And 70% of Sports Fematics are either parents or grandparents. 29% try products before others. 61% tell others about our favorite products. 34% are influenced by social media for purchases. 26% are influenced by social media for clothing purchases specifically. 46% use social media more than an hour each day! Now let’s look at some data from Super Bowl 50 to see what commercials resonated with women. CivicScience asked over 36,000 consumers about their general thoughts about the Super Bowl commercials right after the big event. Here is the favorability breakdown of some of the commercials. And sports advertising and beer seem to go hand in hand. Do you think beer is in the foreground of our minds? While beer is ok, we might rather want a nice glass of wine. By paying attention to topics that resonate with women, marketers and advertisers can better reach this growing fan base during sports broadcasts. The Big Dance is upon us, and CivicScience asked 1,867 US adults over the last two weeks how closely they are following NCAA March Madness. Of the people that said closely or somewhat closely, over a third of them were female. Although not as evenly split as the NFL, that’s still a lot of follower who are women. Last year, people spent 664 million hours watching the March Madness tournament live on TV and streaming on various devices, according to an estimate Turner Sports compiled for Fortune. I dug into the CivicScience data to find out how many hours of sports TV female NCAA Basketball fans watch each week. I was surprised to find that 58% watch between 1-5 hours and a total of 87% watch at least an hour of sports TV each week. *41% Sports Fematics represents 3,871 responses from women between 3/4/15-3/3/16 answering the question “On a scale of 0-5, how interested in sports are you right now,” and responding either 3,4 or 5. CivicScience is fundamentally changing the way companies find and use consumer research with our leading intelligent polling and real-time consumer insights platform. Our trusted, scientifically-validated data is source by partnerships with hundreds of premier websites, who use our polling applications to survey millions of people each week.